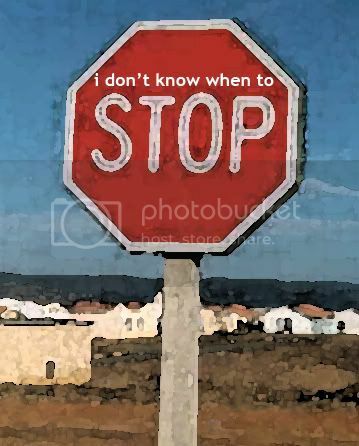 Knowing When To Stop (Anything)! I’ve had a nasty sciatic pain going down my right leg for almost four months now (!) At first I thought I’d pulled a muscle, then I thought I’d overdone a workout, then I thought I had a slipped disc, then I thought I needed hip surgery, then I thought I just needed to loosen up the joints in that side, then I thought I probably had a tumor, then I thought I was becoming a hypochondriac. But in all these months it never occurred to me until yesterday that my real problem was knowing when to stop doing what I was doing – exercising just about seven days a week to “loosen it up”. In the name of “working it out”, in all this time I’ve continued doing strenuous weighted workouts usually three days a week, and intense speedwalks the other four days of the week. Occasionally when I’m very tired, I give myself a big break by walking in a slightly less maniacal way when I do the cardio, so anyone “with” me is still visible in the background. It’s the joke of my family and friends (my Nazi walk), but I love the rush I get from my muscles communing with nature in this way. It’s not a competitive thing, as I’ve never entered a race, and usually prefer doing it alone without even timing myself. It’s always been one form of self-care for me……..UNTIL the big sciatic puzzle. Look for yourself on this list, and see if you too are in the “insane” cycle. If so, try something new. Think of me, sitting here, relaxing, relinquishing my dearly beloved Nazi walk! Anything is possible. Thanks, I’m glad you like it. I used Dexmedia for the website design and they were great. You got it right! Thanks for your comment! Yes, if you link back to my site if you quote anything. Thanks so much for asking!